You can start a new game at any time by hitting the "New Game" button on the Toolbar. You also start a new game by selecting the "Game->Deal" option from the menu bar or by hitting the "F2" key. 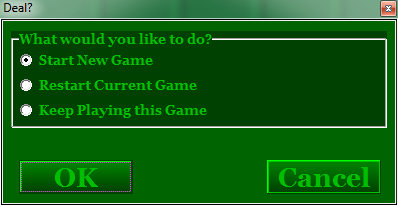 The program will present you with a dialog box that allows you to start a new game, restart the current game or keep playing the current game from the current state.